I just got back from Cancon 2009. I drove down to Canberra on Saturday and drove straight to the Exhibition Park in Canberra (EPIC) and the National Tally Room there. This room is where Federal elections in Australia are tallied and decided. 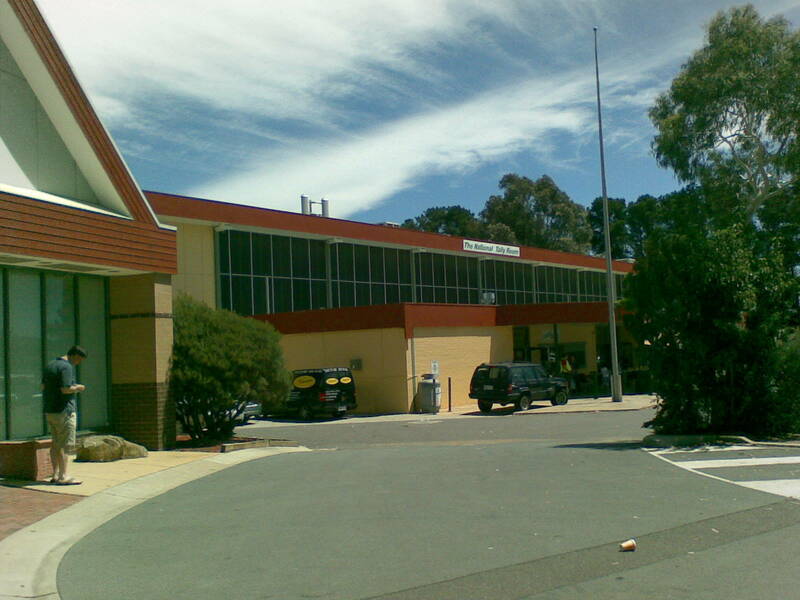 In addition it is where the annual convention of the Canberra Games Society is held. Cancon. This year was the 31st Cancon (but I didn’t get the t-shirt). From the outside, the National Tally Room looked quiet, just cars parked around the area indicating that something was on. It was great to get to the relative cool of Canberra after the heat of Sydney (I left Sydney at 10:00 am and the temperature was already 32 having only fallen as low as 25 the night before). Canberra was also around 32 when I arrived, but without the humidity. Once I got inside the hall it was a different matter. There were more people at Cancon this year than I can remember on any of the previous trips I have made to Cancon. 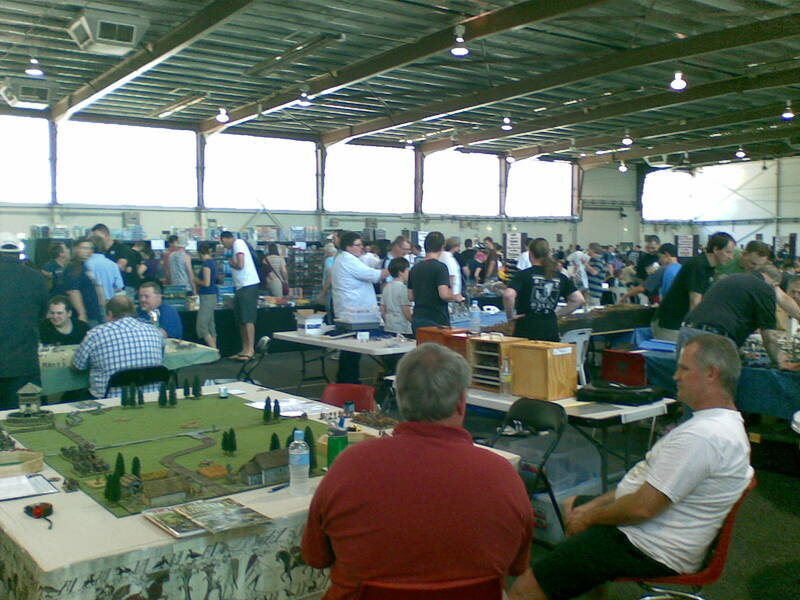 Cancon is one of Australia’s largest Wargames Conventions and whilst small compared to say Salute in the UK or Origins in the US, it is never-the-less arguably the premier wargaming event on the Australian calendar. This year there appeared to be more competitors in competitions (and more wargame rule-sets had competitions around them) than in previous years. 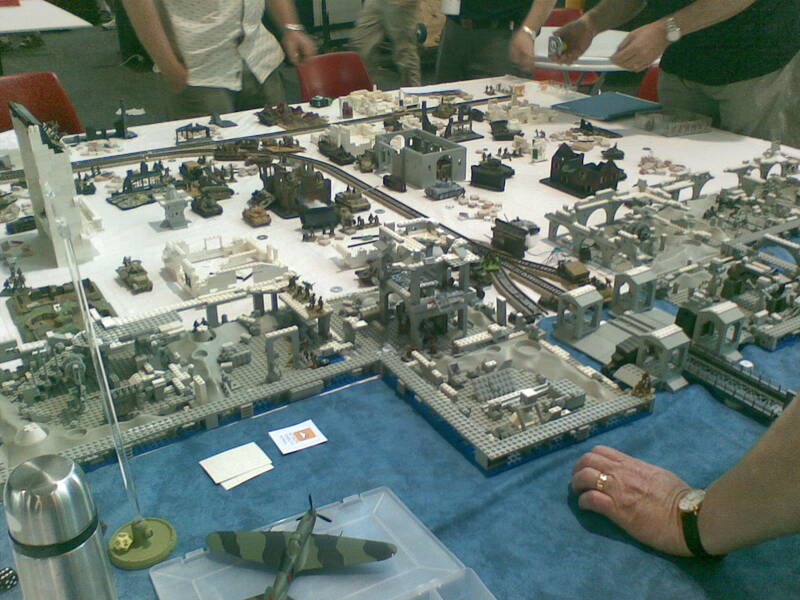 This is a good thing for the hobby as a whole and the spirit in which the games were played appeared to be good too. On top of the increased number of competitors there also appeared to be a larger trader area than in the past with plenty of ways to spend hard earned dollars and even in these days of financial organisation meltdowns the traders seemed to be doing a brisk trade. Over at the competition tables, many of the figures looked superbly painted although with a few exceptions, such as the Aegyptus competition, the terrain was very drab and plain. However, there were some demonstration games where the scenery was much better. One that took my fancy appeared to be a World War II game set around capturing and holding a dock area. The time was winter, and the scale was 28mm. This was especially memorable as the buildings and machinery areas were made from Lego bricks and the railway tracks were from the Märklin System of model railway tracks. It was an impressive looking game and the Lego actually worked well to help the appearance of the game. Speaking of good scenery and pretty figures, there was a demonstration game based around an amphibious assault of a fortified position. It appeared to contain British and Russian forces (although I will happily be corrected on that). 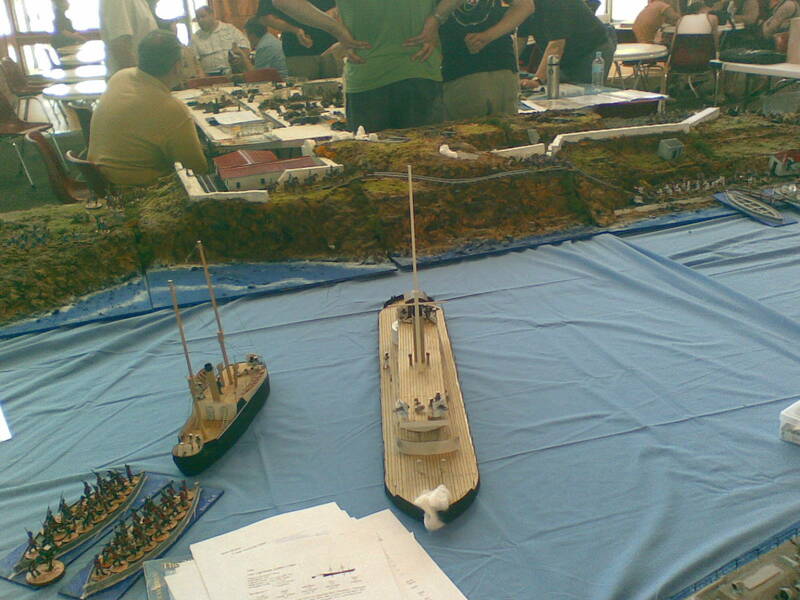 There was a nice headland with beachhead areas, beautifully painted figures and some wonderful scratch built boats and ships. There were the whale boats that were being used to bring troops ashore as well as naval vessels to bombard the position from the sea. 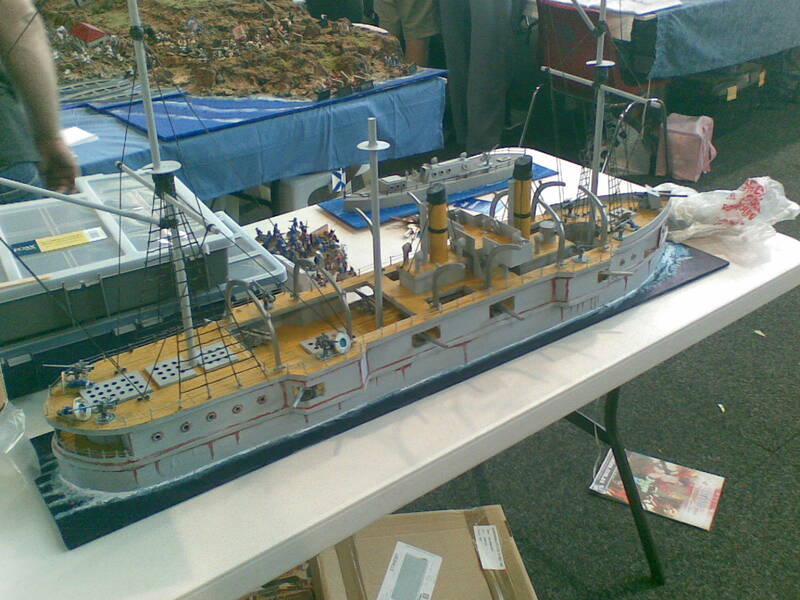 Rounding that off were some torpedo boats as well. The pièce de résistance however of this game was the large cruiser built, I guess, to 28mm scale, that was providing the bombardment of the shore positions. I’ll leave you with that picture, just noting that this Cancon was perhaps the best I can remember and one that will see me heading to Canberra around the Australia Day long weekend in 2010. The big cruiser after being severely damaged in the battle is returned to dry-dock for repairs - actually, this was a very impressive model. Hi, I just noticed your post about Cancon 2009. I also noticed you mention you did not get a Cancon 2010 T-shirt. What size would you like, we have a few 2XL shirts (Red) left over. The great colonial game I mentioned above was actually a fictional attack by the Russians on Melbourne I am guessing as the British side was defended with Victorian militia and HMVS Cerebus and HMVS Albert amongst others. Here is a more complete write-up of the Defence of Melbourne along with descriptions of the troops, ships and terrain. A very impressive game. If you look elsewhere on that blog you will find descriptions of the building of the game, the vessels etc. A site well worth the visit. Che tipo di carro armato volete costruire? I should add that CanCon is organised and presented by the Canberra Games Society and information specific to CanCon 2010 can be found at http://www.cgs.asn.au/cancon2010.html. Unfortunately, as luck would have it, I will be in Singapore on a business trip when CanCon is on in 2010 – and I was even thinking of competing this year. Oh well, there is always next year.